Biella Coleman is an anthropologist who is fascinated by Anonymous and the idea of the hive-mind. She’s an author, and has written numerous pieces on hacker culture.Coleman’s TED Talk on Anonymous is a great introduction to the hive, and she documents any and all notable happenings as research material for her books on the subject. While Biella isn’t known publicly as an Anon, one would need to be insane to think Jane Goodall is living with the chimps without mimicking their behavior. Infamous computer hacker DBCoopa is one of the Anon hackers you don’t often hear about. That’s because after turning the Dallas, TX Dept of Corrections servers into his personal playground in the early 2000s, Dell Cameron went straight and joined the media. Now a struggling investigative journalist for the Daily Dot, Cameron is the current head of YourAnonNews, a popular Anonymous news brand. Dell Cameron is one of Anonymous’ earlier hacktivist members. 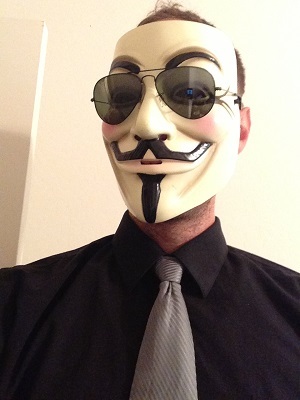 Originally getting involved with Anonymous during several of their high-profile criminal cases, loud-mouthed lawyer Jay Leiderman is a prominent member of Anon. Leiderman regularly meets with Anon inner-circles and helps guide followers in the right direction of breaking laws. By defending several high-profile Anons (although not very successfully, considering all his clients are in prison), Jay Leiderman has propelled himself from an ambulance chaser promoting on the back of a phone book to Sean Penn status inCarlito’s Way. An anarchist in the mountains of Colorado, Christopher Banks is known online as Jackal Anon, a Twitter user who branded many large Anonymous accounts, including YourAnonNews, an activist new aggregation service, and SexyFawkes, an Anonymous pinup blog filled with nudes, most notably frequented by his girlfriend, and soon to be wife for legal purposes, Amelia Cohen. In spring 2013, Banks ran an IndieGoGo campaign to fund a YourAnonNews websitepromised to launch this summer, but, over $54k in public donations later, the site still hasn’t materialized. The group released public statements attributing the failed project to Christopher Banks’ child support (since proven false), a Time Warner injunction against the usage of the Guy Fawkes logo, and rumors of the YAN team borrowing the money Harry & Lloyd style (Dumb and Dumber). Originally an investigative journalist, Amber Lyon blew the whistle on the media and forged her own path through the media, using the connections she made in her career to catapult herself to internet fame. Lyon joined Anonymous through Dell Cameron, whose company she hired to build her Muckraker site. Amber contributes her insight and experiences to YourAnonNews and the Anon reporter while helping promote the Anonymous brand. Brian Penny is a former Business Analyst at Bank of America turned whistleblower, freelance consultant, and troll. He’s a frequent contributor to The Street, Huffington Post, Cannabis Now, and Fast Company.